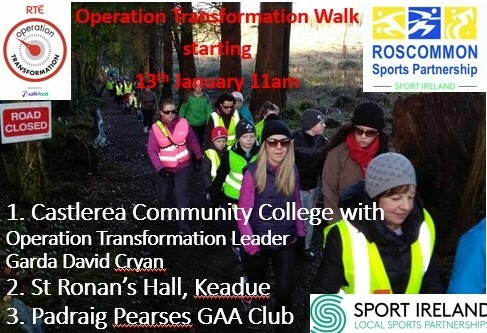 Roscommon Sports Partnership and Sport Ireland have linked up with the Operation Transformation team to promote National Walk Day on Saturday 13th January. 1. Castlerea Community College with Operation Transformation Leader Garda David Cryan, registration from 10am, please come early. All ages and abilities welcome on the day, perfect family event. Children must be accompanied by an adult.